As Thailand will assume the ASEAN chairmanship title next year, let’s take a look at one of the bloc’s key moments when ASEAN has signed first e-commerce agreement. Authorities from four countries have intercepted drug precursors destined for the Golden Triangle and intended to make 30 million methamphetamine pills in their latest crackdowns on Thai and foreign drug gangs. Thailand fetched 1.4 trillion THB (44.5 billion USD) from cross-border trade in 2018, up 6 percent over the previous year, but falling short of the set target of 1.5 trillion THB. The rise of artificial intelligence (AI), the use of Augmented Reality (AR) and the development of Virtual Reality (VR) are some of the 17 trends disrupting the rapidly-growing halal (permissible or lawful in traditional Islamic law) tourism industry according to a report released yesterday. 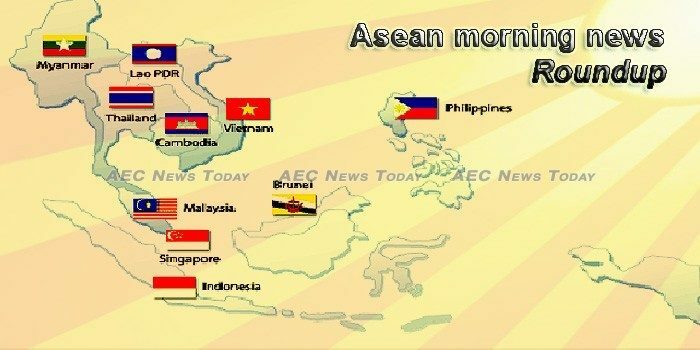 Three-quarters of educated professionals surveyed across the ASEAN bloc say China is the country most likely to fill a vacuum created by a perceived growing lack of American interest in the region, according to a report published by a Singaporean think-tank Tuesday. The latest data from China’s Customs Administration shows two-way trade between China and ASEAN grew by 14.1 percent to a record US$587.87 billion in 2018, compared to 2017. MindSphere World, a global Industrial Internet of Things (IIoT) association, has launched a Singapore-headquartered Asean chapter. Japan’s National Institute for Defense Studies says China is trying to build regional support for the country along the South China Sea by dividing Southeast Asian nations. A survey of hundreds of executives shows that China is no longer the top investment hotspot for Taiwanese businesses, while Southeast Asian nations have become their new darling, as a result of the US-China trade tensions and growing uncertainties. The Asia Regional Fund Passporting (ARFP) scheme is expected to roll out next month and will connect the fund markets of Australia, Japan, Korea, New Zealand and Thailand. Investigations into what it means to be human have often focused on attempts to uncover the earliest material traces of art, language, or technological complexity. Tiger-range governments agreed on the urgent need to address critical management gaps across the tiger’s range at the 3rd Stocktaking Conference on the Global Tiger Recovery Programme. Cambodia received 6.2 million foreign tourists in 2018, an increase by 11 percent compared to the previous year, of them 1.9 million were Chinese visitors, up 70 percent. Cambodia is among the 41 states whose human rights records are under scrutiny at the ongoing 32nd session of the United Nations Human Rights Council’s Universal Periodic Review (UPR) Working Group. For the last 18 months, the Cambodian government has seen foreign conspiracies everywhere it looks. The largest opposition party, the Cambodia National Rescue Party (CNRP), was plotting a coup with American backing, the government says, and was summarily dissolved by the Supreme Court in November 2017 as a result. The CNRP’s president, Kem Sokha, was also arrested for “treason,” though the government gave scant evidence of this. Indonesia logged a total of 392.7 trillion rupiah (27.86 billion U.S. dollars) foreign direct investment (FDI) last year amid global economic uncertainty, the country’s investment coordinating board announced here on Wednesday. Transparency International Indonesia announced that the 2018 Corruption Perceptions Index (CPI) of Indonesia climbs seven ranks to 89th position out of 180 countries. Indonesia has recorded transaction of tourism packages at Rp2.4 billion during the 25th International Travel Fair (ITF) Slovakiatour which was held in Incheba Expo Bratislava, Slovakia, from January 24 to 27. Destinations of the travel tour included Kalimantan, Bali, Lombok, and Java. Prime Minister Thongloun Sisoulith yesterday advised labour and social welfare authorities to carry out the country’s labour skill development policy to meet the needs of the job market. The Department of Bridges and Roads has said it needs 1,200 billion kip to implement 20 projects and 148 contracts on road repair and construction nationwide. The upgrade of the 9.4-kilometre road from the Tanmixay crossroads in Xaythany district to Sikeuth junction in Naxaithong district, Vientiane, is likely to require a nine-month extension as work is running behind schedule. Bank Negara Malaysia has launched a RM1 billion fund for affordable home ownership for those earning RM2,300 and below. An economist has called for greater access to data for independent researchers in the field of poverty and inequality, saying this is crucial to gauging government policies and mapping out effective anti-poverty plans. Malaysia’s decision on the $20-billion East Coast Rail Link (ECRL) is still under discussion and negotiations are now at the government-to-government level, finance minister Lim Guan Eng said on Wednesday. WEDNESDAY validated expectations of “bloody” bicameral conference committee talks on the proposed P3.757-trillion national budget for this year, with no less than the Senate president threatening to withdraw the version of his chamber from the table before lawmakers concerned met again on the spending plan that day. The government’s outstanding debt reached ₱7.3 trillion last year, growing by 9.6 percent from ₱6.7 trillion in 2017 amid higher domestic and foreign borrowings. THE Executive branch will likely ask the Commission on Elections (Comelec) to exempt at least P500 billion worth of big-ticket projects from the election spending ban to avoid delays in the government’s massive infrastructure program. IMMERSIVE in-flight entertainment headsets, an augmented reality colouring mobile application and a mobile service that notifies travellers abroad about nearby events and deals – these are some of the innovations brewing over at Singapore Airlines’ (SIA) newly-launched innovation lab, KrisLab. Business is on a high for firms across the corporate landscape with smaller companies keen to expand overseas while the big players are reaping ever higher profits. Over the last few years I have written several articles on the HDB issue, the last ones being on 10th and 11th December 2018 but as this hot topic arose again while I was at Hong Lim and on my threads recently, I want to take you back to them. Thailand aims to export 9.5 million tonnes of rice this year, the Thai Rice Exporters Association said on Wednesday, a 14% decline from 2018. The wife of detained footballer Hakeem AlAraibi has sent an emotional appeal to Thailand’s Prime Minister asking for the junta leader’s help as she fears for her husband’s life. Vietnamese consumer prices rose slightly in January on increased shopping demand as the Tết (Lunar New Year) holidays were approaching. VietJet Aviation Joint Stock saw a 24% increase in total revenue last year from 2017, earning 71 billion baht, of which 49 billion was from air transport (a gain of 49%). Vietnam’s tuna exports are expected to thrive in 2019 as several obstacles regarding origin certification have been removed, said the Vietnam Association of Seafood Exporters and Producers (VASEP).